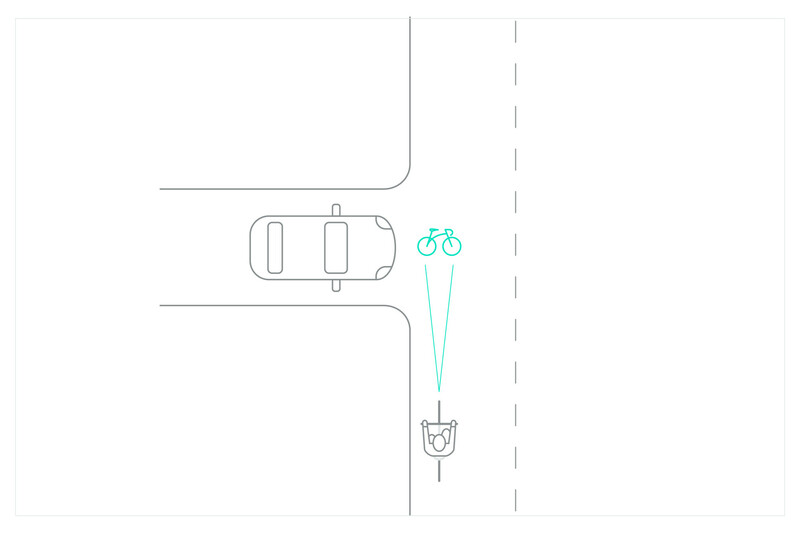 Research shows that in Britain, 79% of collisions involving cyclists happen when the cyclists is going straight ahead and a vehicle turns into their path. 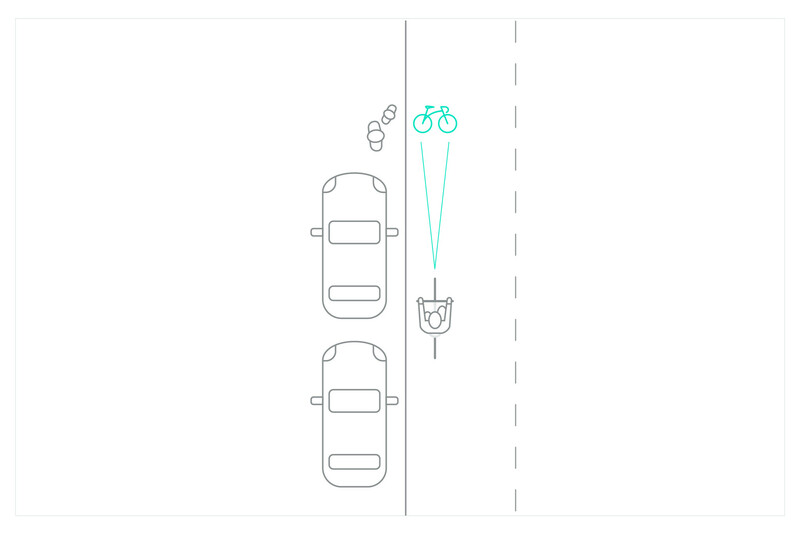 Common situations are when a vehicle is travelling in the same direction as the cyclist and turns left without seeing them, or when a car pulls out of a junction into the cyclist's path. 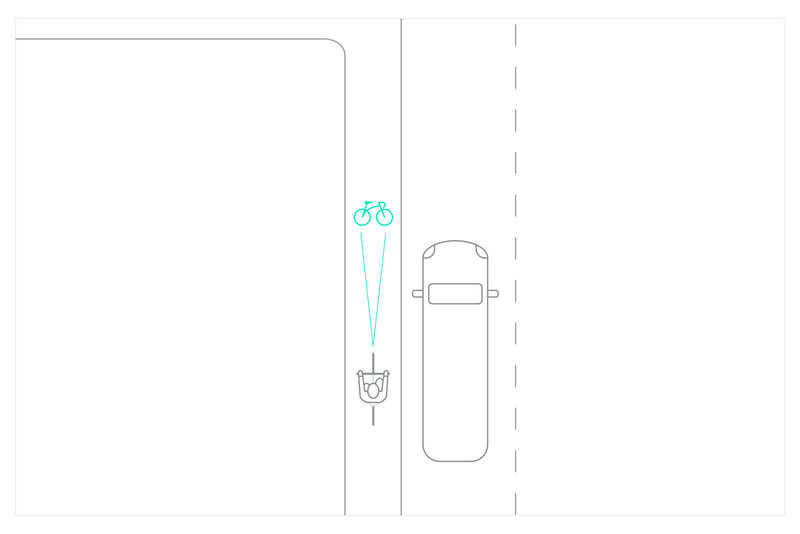 The green bike symbol projected on the road by the Laserlight in front of a rider alerts other road users and pedestrians to the presence of a cyclist and improves the cyclist's visibility. The colour green was chosen as the human eye is most receptive to light of that wavelength - providing maximum visibility in different light conditions and on different surfaces. Let's take a bird's eye view of 3 key situations where the Laserlight works to keep cyclists safe on city streets. When cycling in the city, getting caught in a vehicle's blind spot is a dangerous place for a cyclist to be. The Laserlight image projected on the ground 6 metres in front of the bike gives vehicles a forward warning of your presence and makes it less likely that they will turn across or cut in front of you. When approaching a junction, it's not uncommon for cars to pull out into the road into the path of a cyclist after not spotting them. The Laserlight projection alerts cars waiting to pull out at a junction to the fact that you're approaching on a bike. Many of our Beryl Laserlight riders tell us that the light has prevented them having collisions with pedestrians. One of the reasons bikes are a great mode of transport for the city is that they are very quiet and don't contribute to noise pollution. However, that means that often pedestrians don't hear or see you coming, especially if they have headphones in or are distracted by a phone. The Laserlight gives pedestrians advanced warning of your approach, giving them the time to react and not step off the pavement into your path. How do we know the Laserlight technology improves visibility? We’ve always been confident that the Laserlight makes a big difference to cyclists’ safety. To be sure, we needed an expert, fully independent assessment. The Transport Research Laboratory (TRL) carried out independent research in 2015 to find out the effectiveness of the light on behalf of Transport for London (TfL). The research was carried out in London and included 3 distinct tests. 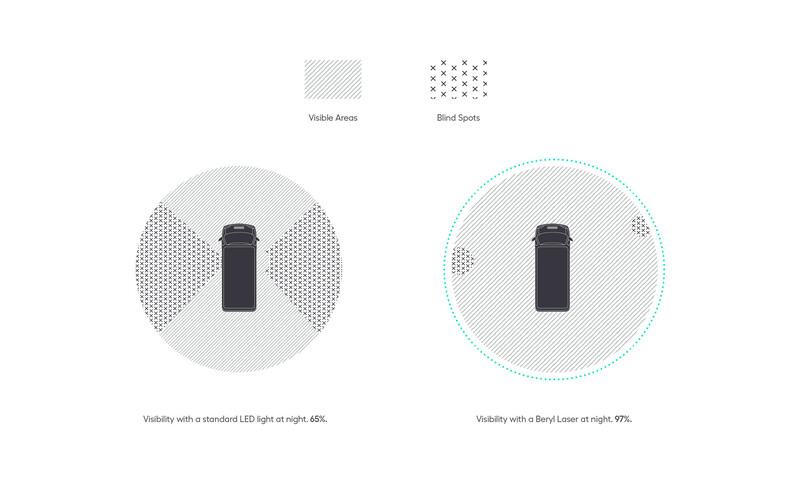 The findings were clear - the Laserlight improves the visibility of cyclists on the road. For all vehicles types, the Laserlight improved visibility of the cyclist. For vans, the visibility improved to 97% - an increase of 32%. As a result of the TRL findings, our Laserlight technology has been fitted to over 10,000 bikes in London's Santander Cycles scheme. Since the report was published, we have refined the technology behind the light and the Laserlight has developed along with our company. The Laserlight Core will be the next evolution of a product designed with cyclists in mind, to make cycling in our cities safer and more enjoyable.